The course instruction builds upon previous knowledge so it is best to complete the subjects in order. For the SCA-On-CUE Level 2 certification, all subjects 5 – 8 need to be completed and satisfactorily passed. The SCA encourages medically qualified applicants who possess qualifications sufficient to practice as a medical practitioner; these include MD, MBBS, MBChB or equivalent degrees. Learners will need to be competent in English to complete the courses. Assessment Components: The self-assessments and examinations are completed via an online web-based system. For self-assessment questions, once completed, the screen will refresh with the answers and explanations. Once all self-assessments and case studies are submitted examinations can be done whenever you are ready. Examinations are 50 multiple choice questions per subject which are conducted online. Certificate Upon Completion: Upon meeting the assessment components for each course level a completion certificate will be issued from SCA and iTeachU. For individual subjects, a statement of activities will be issued. If four individual subjects are completed from one level a certificate of completed will be issued. The SCA-On-CUE subject 5 tutorials introduce building block tutorials related to safety and care of TEE probes. More advanced anatomy and Doppler application are covered, as well as a calculations workshop tutorial. Learn about advanced reporting using our reporting database for comprehensive reporting. The SCA-On-CUE subject 6 systematically goes through the advanced assessment of all the valves, including prothetic valve assessment. 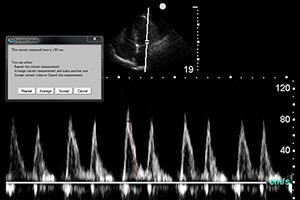 The SCA-On-CUE subject 7 emphasises the application of echocardiography in clinical situations. The SCA-On-CUE subject 8 integrates all the skills and knowledge learned. This subject offers 50 comprehensive case studies centered on five themes.